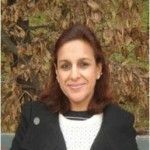 Parenting >> blog >> Food and Nutrition >> Which and How Much Dry Fruits to Consume During Pregnancy? Pregnancy is physiologically and nutritionally a highly demanding period. Good nutrition and optimum nutrition during pregnancy will keep you and your developing little one healthy. There is some increase in calorie requirements but there is a large increase in protein and other vital nutrient requirements. Hence focus has to be more on Nutrient-dense foods and not on Calorie-dense foods. Serve as a great source of protein, all the more beneficial for vegetarians; almonds and pistachios have the highest amount of protein. Give you a boost of dietary fiber, especially the ones with brown coats. Constipation is a common problem of pregnancy and fiber from nuts can work as a natural laxative. Provide a good amount of folate, mainly coming from peanuts and hazelnuts. Folate is a B vitamin which is very important for your baby’s development during the early stages of pregnancy. Give you an appreciable amount of iron, coming mainly from cashews and pine nuts. Iron needs increase tremendously during pregnancy. You have to build Iron stores in your baby's body which will last for the first 6 months after birth plus you have increased blood volume. Snacking on nuts with a glass of orange juice is a great way to boost your iron intake and meeting your increased needs for this mineral during pregnancy. A great way of getting Healthy brainy fats..the Omega3s. Walnuts are one of the richest plant sources of omega-3 fats. Serve as a great source of Calcium. The need for Calcium is very high during pregnancy and milk alone cannot help, so you need to take, a variety of foods to meet your increased Calcium needs. This mineral is mainly found in almonds. Which Nuts To Consume While Pregnant? By now you have got a fair idea of some of the most important nuts to be taken during pregnancy. To make it more easy for you to remember, let us look at the list of Nuts, that are vital during pregnancy. WALNUTS - Packed with Omega 3 fats or the Brainy fats that we mentioned earlier. Long chain omega-3 fats are important for your unborn baby's nerve, brain, and eye development, hence also termed as ‘Brainy Fat’. Since your body can't produce this Essential fat on its own, it’s important for you to get them from your diet. HAZELNUTS - We have been talking about Folate and Hazelnut is a great source of this B vitamin. Hazelnuts are also a good source of fiber and protein and are especially rich in vitamin E.
CASHEWS - Zinc is one of the key nutrients necessary for a healthy pregnancy and growing babies have a high zinc requirement. Including cashews as part of your diet can help you meet your increased Zinc requirement. Enjoying 15-20 pieces of cashews will roughly give you 5mg, or around 50% of your daily zinc requirement. Isn't that amazing! ALMONDS - Almonds, the most popular dry fruit is one of the richest sources of Proteins. An amazing fact is that munching on 10 almonds will give you 3gms of protein, which is 13% of the daily recommended dietary allowance (RDA) for pregnant women. Moreover, snacking on almonds is an excellent way to meet your fat intake during pregnancy. Almonds contain a balanced amount of polyunsaturated and monounsaturated fats; the healthy fats. Not only are these fats heart-healthy, but they also support the healthy growth and development of your baby. Sprinkling a few slivers or handful of almonds into your hot ragi or oats porridge, morning milkshake or even on your upma or poha will go a long way in providing Proteins, Smart Fats, Vitamin E, Magnesium and many other nutrients for you and your baby throughout your pregnancy. PISTACHIOS - This small, tiny nut is packed with proteins, fiber and antioxidants. Since pistachio has a low Glycemic Index, which means it brings a slow rise in blood sugar levels, it is a great nut for women with Gestational diabetes. Are Nuts Safe During Pregnancy? This is a big concern among many women and at the same time is a bit confusing. Some of the research indicates that if the mother herself is allergic to nuts then she should avoid taking nuts during pregnancy or when she is breastfeeding. However, the American Academy of Pediatrics (AAP) after reviewing the clinical evidence regarding nutrition and the development of allergies during pregnancy and breastfeeding, stated that there is no evidence to show that what a woman eats while pregnant or breastfeeding affects the chance of their child developing an allergy. Similar statements have been made by the Australasian Society of Clinical Immunology and Allergy. So, the final verdict is, eat in moderation and if there is a family history of allergy to any one particular nut then avoid taking it during pregnancy or lactation period. Always Remember: What to Avoid Eating When Pregnant? 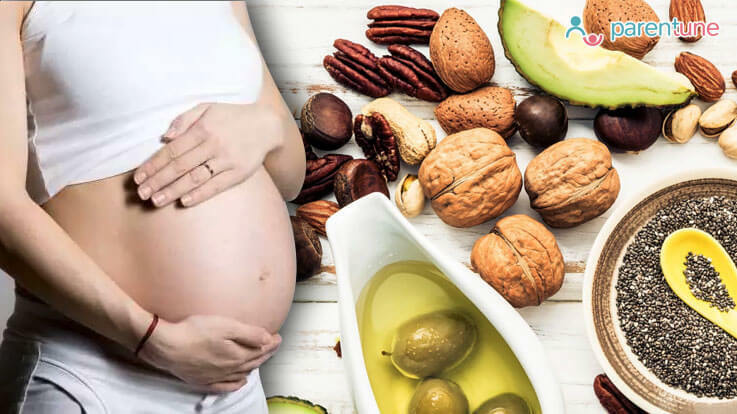 How Much Of Nuts Is Good During Pregnancy? A Handful of nuts or 20-25 gms/day is the suggested amount. You can eat a mix of nuts to get nutritional benefits from each or eat one which you like the most but again handful. Almonds, cashews, pine nuts, and pistachios are the lowest-calorie nuts at 160 calories per 28gm (per serving). There are different ways in which you can have nuts. The list is umpteen. Mix it in your smoothie or milkshake or porridge to get a Calcium-rich meal. Add powdered Cashews or almonds to any of your gravies and give a healthy creamy texture to your curries..No need of adding cream. Add any of your favorite nuts to some savory snacks, like, upma, poha, dhokla or to some chutneys and dips. Adding roasted cashew/walnuts to salads made of greens, broccoli, and strawberries with vinegar dressing will make it a Super Iron-rich snack. Finally, if you cannot think of any other innovative way, then just take a handful of it and munch it in between meals. Enjoy healthy eating and have a Safe Pregnancy. Importance of calcium for pregnant..
First Trimester Pregnancy Diet Tips..
Hello I m towards 4months pregnant now ,I take my..
My diet is completely bad. I don't take any medici..